I recently had a request to put a few things in a new shop in Indianapolis that specializes in handmade items. It’s an exciting development for me and I have been going through some of my things to perhaps place them there. She expressed interest especially in the gift tags so I have been looking at what I have that has not been listed in my etsy store. I had plenty of small gift tags but not as many of the aceo sized ones. I used a few blanks that I had left and made these up today. 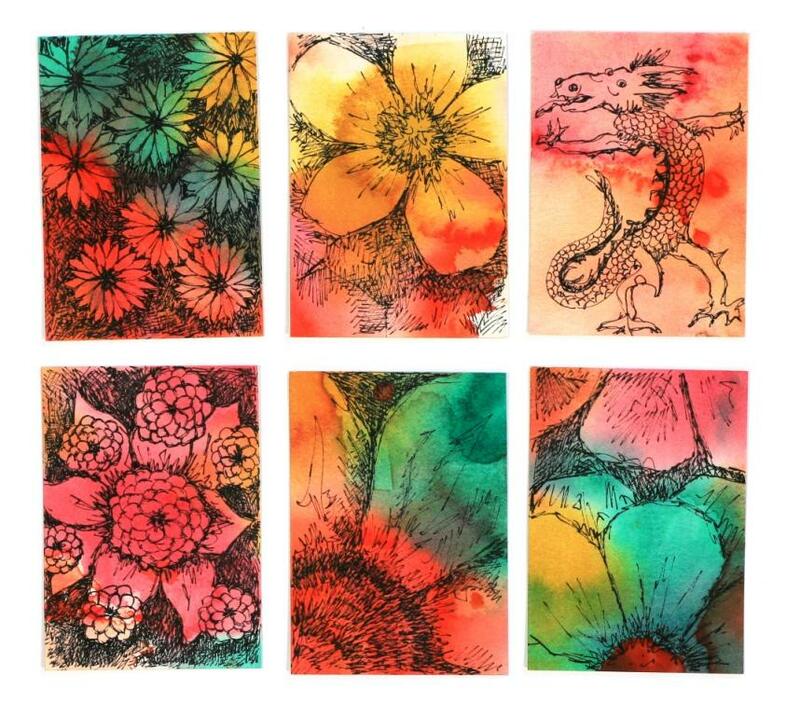 These washes seem to lend themselves to abstract florals, but I rather like the funky dragon. 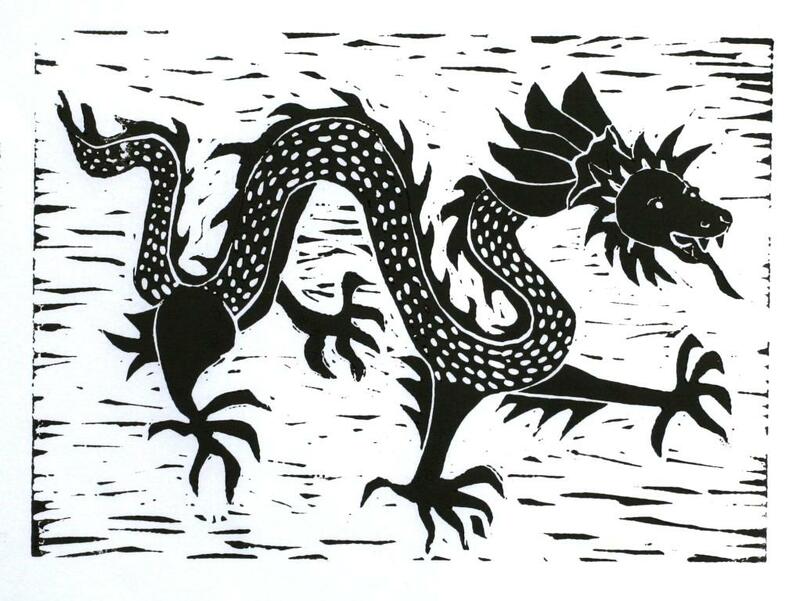 I think I will include a few of my linocuts, too. I can easily make a few more and package them appropriately. All of the price points should be low enough for impulse purchases, even with their commission. I am also going to see if we can arrange a display for home portraits. If I have a small sample and a photo album with general information, I can let them handle the financial details. I made a triple cut mat for the first time for a holiday gift and decided to use the leftover pieces for some small pieces of artwork. I had to practice what I was doing before I made the actual mat, so I had several small cut outs to use as possible mats. You might have noticed that I rarely make a piece where the predominant color is blue. The mat was blue/gray so I decided to use it as a color inspiration. I laid out a small piece to fit the inside of the mat, but wouldn’t you know, when I penciled out the size, I did it incorrectly. I made it too short. Since I colored it edge to edge I couldn’t use it with the mat. Fortunately, I like the way it turned out. 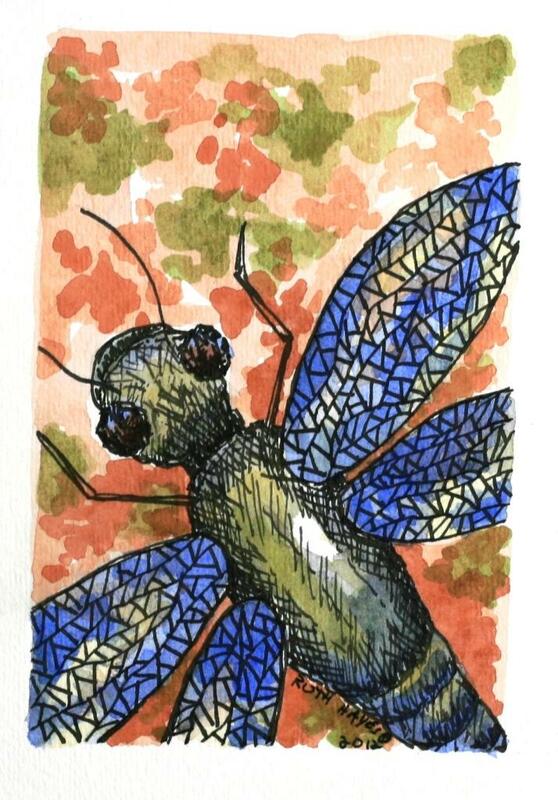 I have been obsessing a little bit with dragonflies lately and I thought that one with blue wings would be a great idea. I love seeing them around the house and pond. The iridescence of their wings is always so beautiful as they flit around. I went with a complementary color palette for the background to set him off. Too much blue if I went for a water effect. I went for cattail colors. When I redid the layout for another small painting, I was more careful and ended up with the still life you see here. I think I like the dragonfly more than the vase. 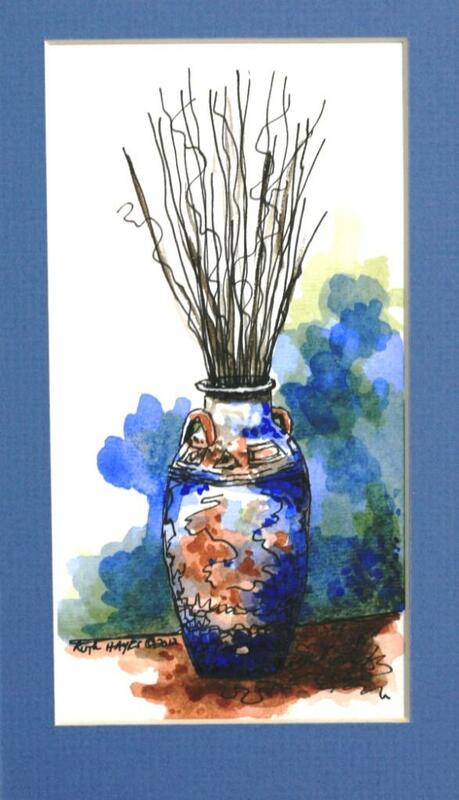 The vase isn’t quite properly grounded and although I have fiddled with it some, it is still not right. I think I will let it sit a few months and then look at it. It may only need a simple fix, but I can’t see it yet. Boy, it is cold outside. The last few nights the lows have been in the single digits and the highs in the teens, so I am happy to be indoors in the studio. I bought a little ceramic heater to warm my feet but otherwise I am comfortable. 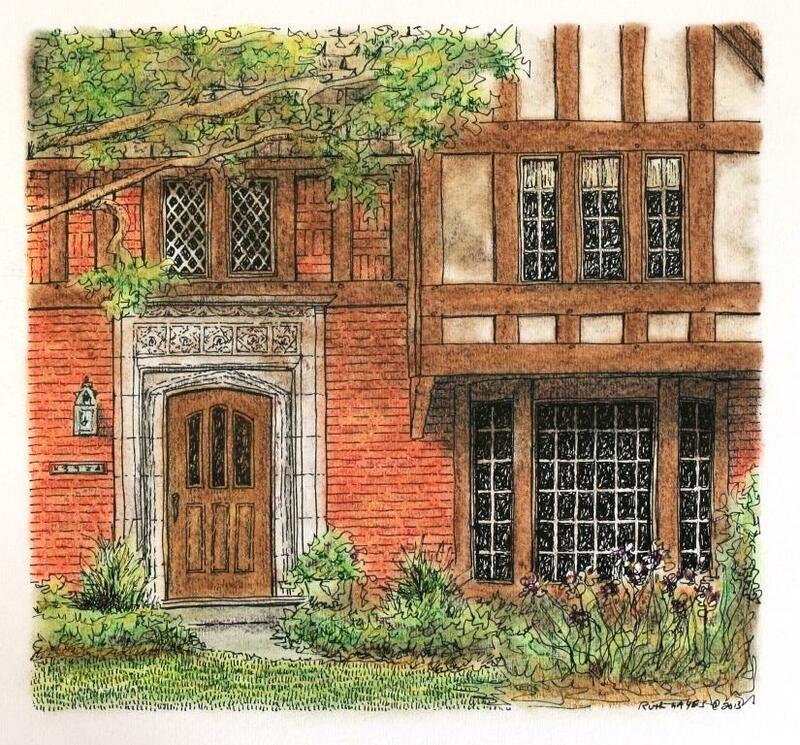 I worked a few days on the pastel for this Tudor entryway. I was unable to totally spray the fixative on it because I am forced to do it indoors, in another room, due to the frigid temperatures. It is VERY stinky and not good to inhale, but if I waited for warm enough weather, it would be a while. So I just put a little on to start the color pop. I am not quite satisfied with the tree in the upper left. It has not imbued the drawing with the coziness that I wanted and I need to to rework it somewhat. I also think I need to go back in and redefine some areas with the pen and perhaps deepen the contrasts. I will let it sit for a day or two and add what is needed. There is a warm up forecast, so I’ll keep my fingers crossed I can go outside. I am continuing my research on making the tiles and I hope to be able to get to them within the month. There are a lot of conflicting opinions on the net and I want to be able to make the right decision. 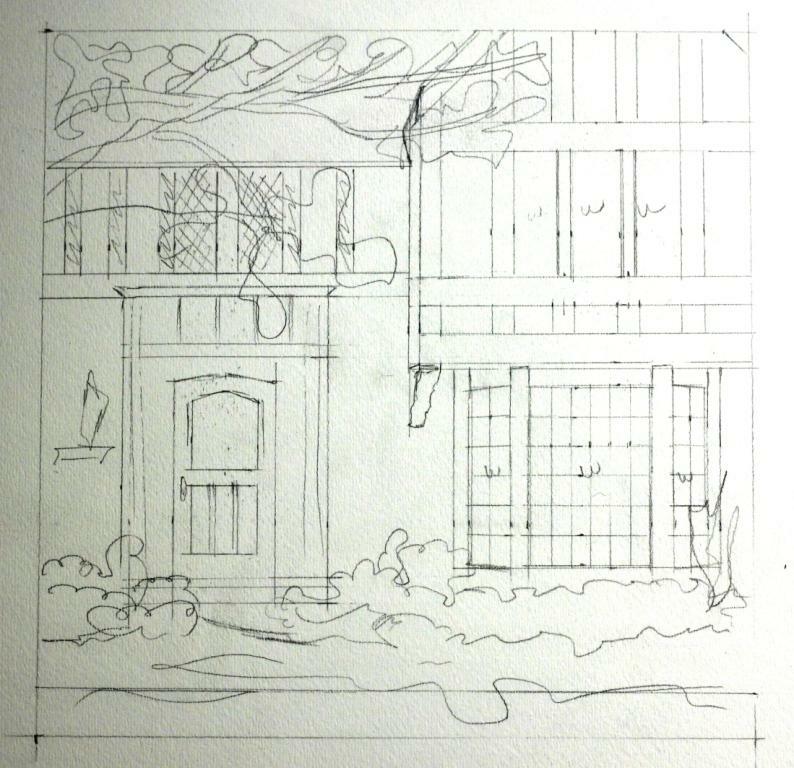 Even though we had some pretty nice weather in the 40’s and 50’s this week and I wanted to be outside, I did manage to spend some time inking in the architectural. The upper right will be light colored stucco and the timber work should be brown. 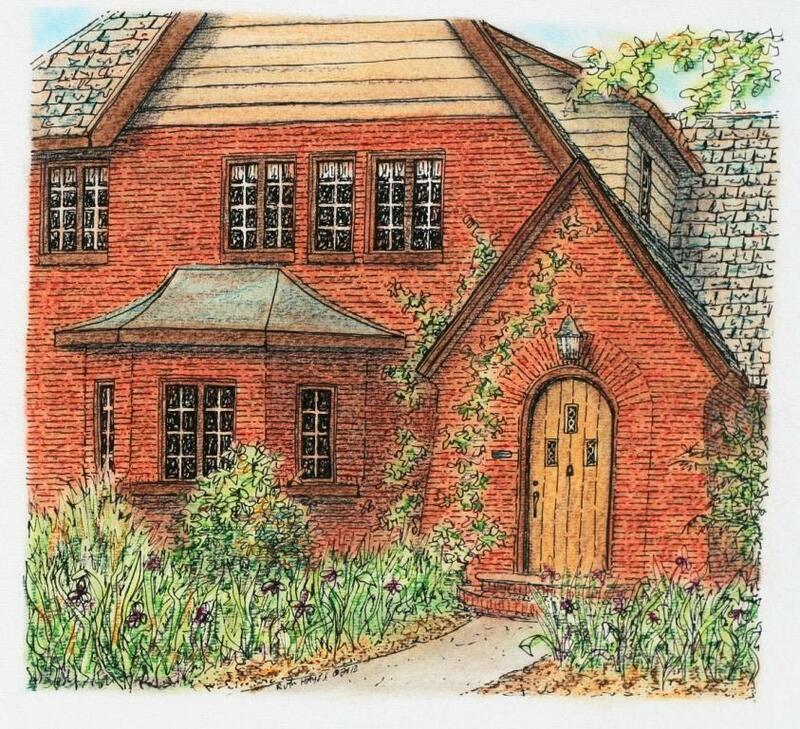 The brick is a variation of reds and I think the door will be a golden brown – or maybe darker to match the timbers. I’ll probably change some of the color choices as I do it. That’s always the way it is, especially when it is not a commission and I can do what I want to. Not much of the shingle work is shown here, but that’s okay. I decided to keep the tree in the foreground to add a bit of depth and intimacy, but I trimmed it back because the photo had way too much and it hid the second story. The stuccoed area above the bay window is a bump out and that will be more clear after the color is put in. This entry has a nice amount of limestone surrounding the doorway. I especially liked the five carved panels up top. I saw the heron again yesterday morning down at the lake. He looked to be trying to fish but I don’t think he is going to be able to find anything for much longer as the water is going to freeze over soon. We are expecting temperatures in the single digits this week. Yuck. It will be a good time to hole up in the house and stay warm. And I have been researching another project lately. I’ve been looking into making some tile coaster sets with my artwork. From what I’ve read, it doesn’t seem too complicated and yesterday I managed to crop some of the animal pieces (the cheetah, polar bear, pelican, and shore bird watercolors) and put them on one sheet of paper to print off – a real computer accomplishment for me. You can see them at my Etsy store under the animals section if you want to. A set of four using one of each would be nice, I think. I may also use some of the still life paintings if this works out. I am a little limited in my choices because I have to be able to crop them to a square for the tile. I plan to make up one set and pass them around to use for a few months to test their durability before I actually try to sell them. I am enjoying mixing up the different styles and media for my artwork a bit. I like doing the architecturals best of course, but I do feel that the linocuts and animal portraits help keep me fresher. This time around I decided to make a companion piece to the last Ohio pastel. 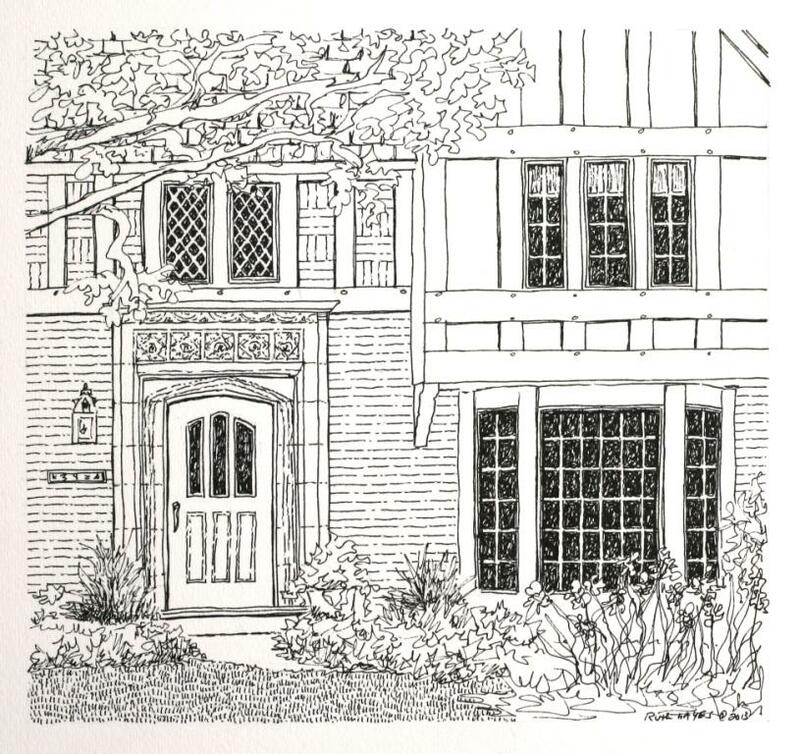 I like working on the smaller scale, so I laid it out at the same size as the last one – about 8″x8″. This one has a limestone surround and a five panel frieze around the door along with the timber work set into the brick. The first floor window is a bay, set underneath the jutting second floor. I have to make up an appropriate wooden front door because the owners have covered it up with a storm. I will keep its slight angle (not curve) at the top. It also has some angled brickwork too which is always fun. I saw a great blue heron down at the lake late this afternoon. He must be happy the water isn’t frozen any more, but I can’t imagine there were any fish or frogs on the shoreline for him to catch. I wonder what they survive on in the winter. our fish are down deep. Perhaps they hunt more at the creeks and streams. Well, first a blizzard and now flooding rains. The pond rose 2-3 feet overnight and the road briefly flooded over. We can get out now, but it is sometimes chancy when we get several inches in a short period of time. Fortunately, the creek goes down as fast as it goes up so it doesn’t last long. I am so grateful it was not snow again, considering that we just got rid of the last of it on Friday. I have been tweaking the latest entryway the past few days and didn’t want to start another one at the same time. 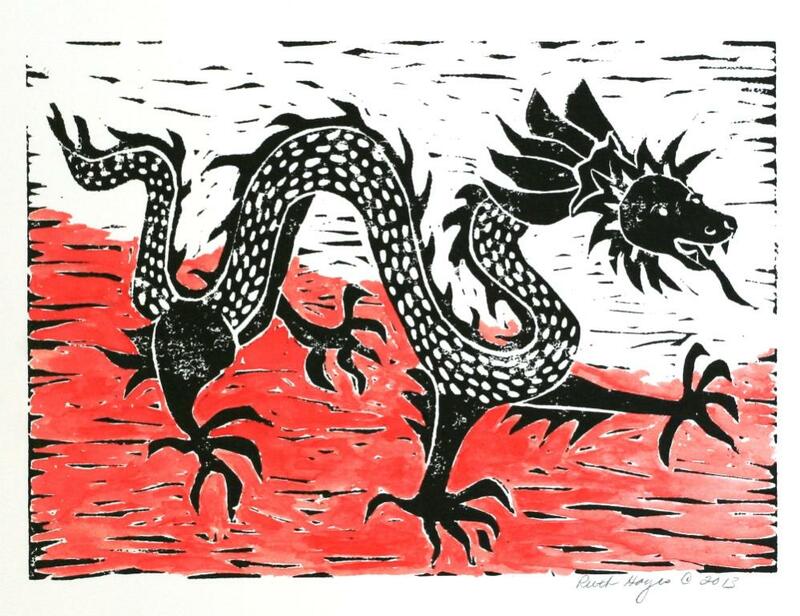 I’ve thinking about trying a Chinese dragon linocut. A few months ago I bought a clip art book of Asian art. I thought I could adapt some of the illustrations into simpler linocuts. There were some nice floral ones but I especially liked the dragons. This one is a variation of one of them. I made the basic cuts fairly quickly, but then was stumped on how to add the body scales. I let it sit overnight to ponder the question. When I looked at it the next day, I knew that I couldn’t try to make individual cuts with a straight edge to delineate them. I haven’t quite figured out the inking process yet and I knew that all I would accomplish would be to over fill them with the brayer. I finally decided to use the scalloped blade and just scoop out a patchwork of scales. I think it turned out well. I thought a partial red background would accent him nicely, so I pulled a print on the heavier paper and this morning, after letting it dry overnight, I used the watercolors to put some on. I didn’t want to color the whole background, so I spent half an hour doing the lower portion. I think it looks like the right amount of color, but what do you think. Should I have colored it all red? I enjoyed putting the pastels on this one in. With the snow finally melting, the drab ground and foliage are coming back out and a bit of color is always welcome. The lake has a skin of ice on it, but it will be gone soon with temperatures in the 50’s in the next few days and rain predicted. Perhaps it will wash all of the sand and salt away. And soon, I will be able to get my car out! I did go ahead with the pastels because I thought it would look better with the richness of the medium. I still have play a little bit with the shadows and the greenery, but by and large it is done. I love the rounded doorway. I am thinking of adding something more to the ivy on the doorway bump out too. It seems to me to be hanging out a bit.